I know I just posted yesterday, but I am so excited by the photographs I received last night that I can’t wait to share them. 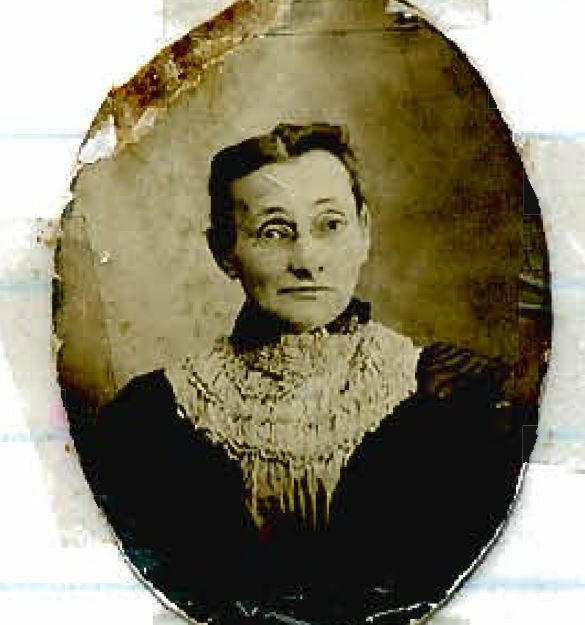 I have been very fortunate to connect with the family of one of Simon and Rose (Mansbach) Schoenthal’s children, the descendants of their daughter Hettie, whose life story I’ve yet to tell. The family very generously shared with me a multitude of photographs, and I will share many of them on the blog in upcoming posts. But some of these photographs are of family members about whom I have already posted. I’ve added those photographs to the appropriate posts, but since I know it’s unlikely that people will go back to find those photographs, I wanted to share some of them here. All of the photographs here are courtesy of the family of Ezra Parvin Lippincott, Jr., Hettie Schoenthal Stein’s grandson. Simon and Rose had ten children; their first two were twins, Harry and Ida. 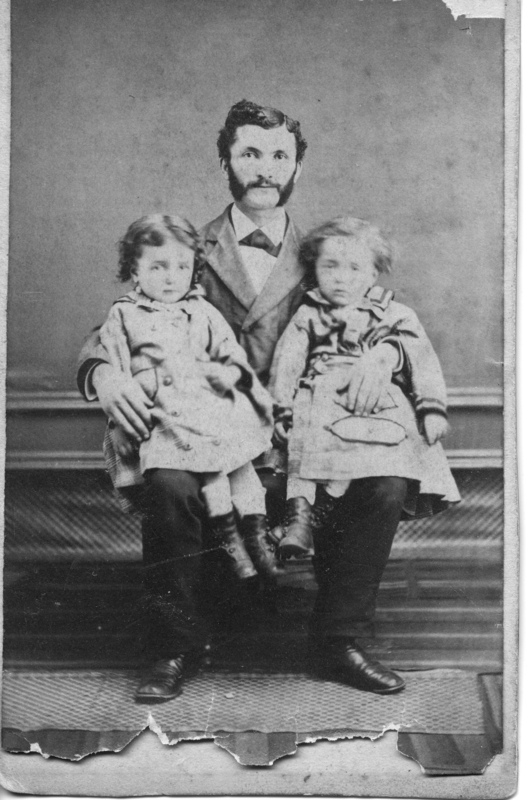 Ida died when she was a young teenager, so I was very touched to see this photograph of Simon with the twins, taken in 1875 when they were two years old. 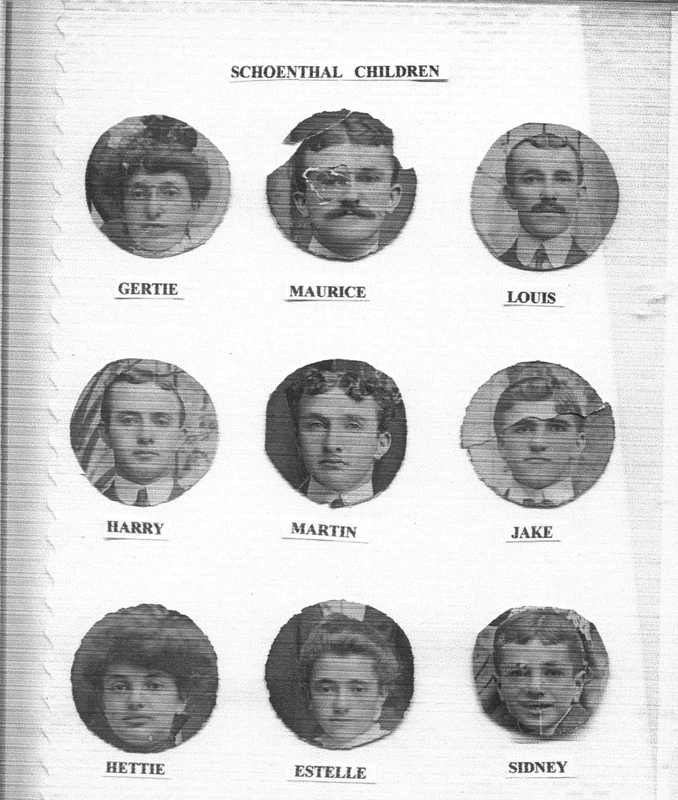 And here is a collage of photographs of the nine surviving children: Harry, Gertrude, Louis, Maurice, Martin, Jacob, Hettie, Estelle, and Sidney. 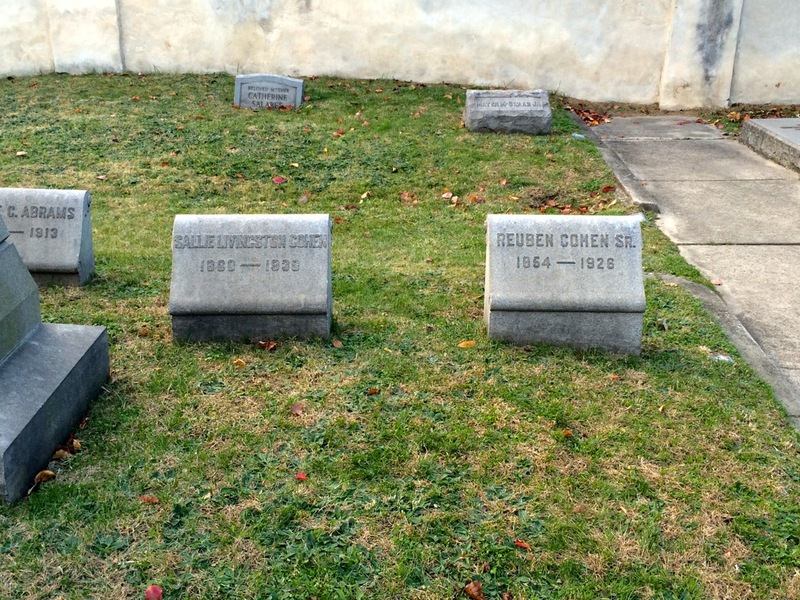 They were my grandmother Eva Schoenthal Cohen’s first cousins. I am not sure, but perhaps one of those men is Harry himself. There are many more to come, but I didn’t want these to get lost in the shuffle. Who is the little boy? For my first 2015 post, I have some wonderful new photos from my cousin Lou. These are photos he scanned from our mutual cousin Marjorie’s photo collection, but we don’t yet know who some of the people are in these photos. We are hoping Marjorie will be able to tell us. Some of these are quite intriguing as I am hoping that they will be photographs of family members I’ve never seen before. 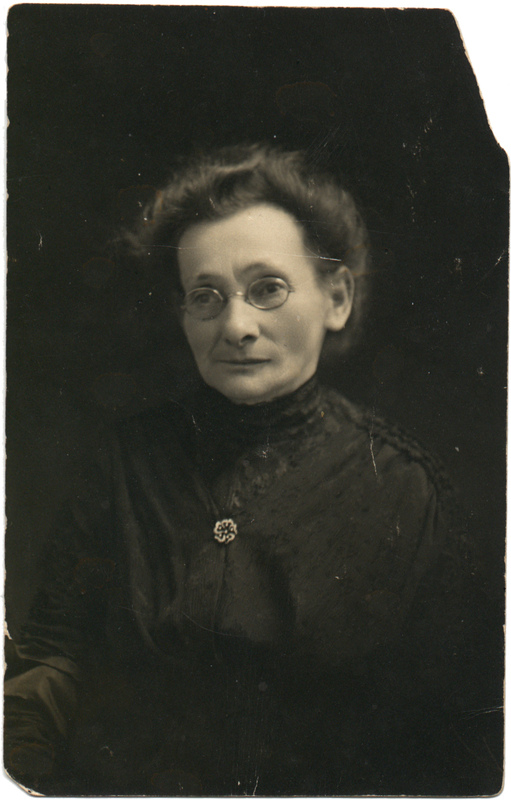 For example, here is a photograph of my great-grandmother, Eva Seligman Cohen, wife of Emanuel Cohen, daughter of Bernard Seligman and Frances Nusbaum. But who is the man to her right? And who is the little boy to her left? Or is the little boy a little girl? Possibly Marjorie? I showed my father the photograph, and he could not identify either person. 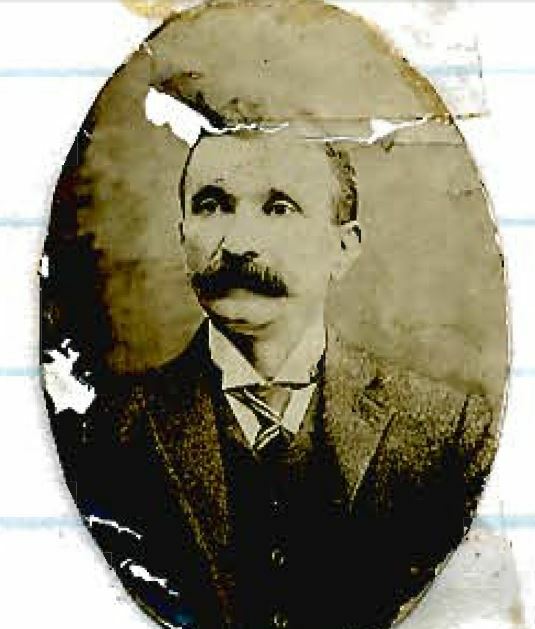 Could the man be Emanuel Cohen, my great-grandfather? That would be the first photograph I’ve ever seen of him. 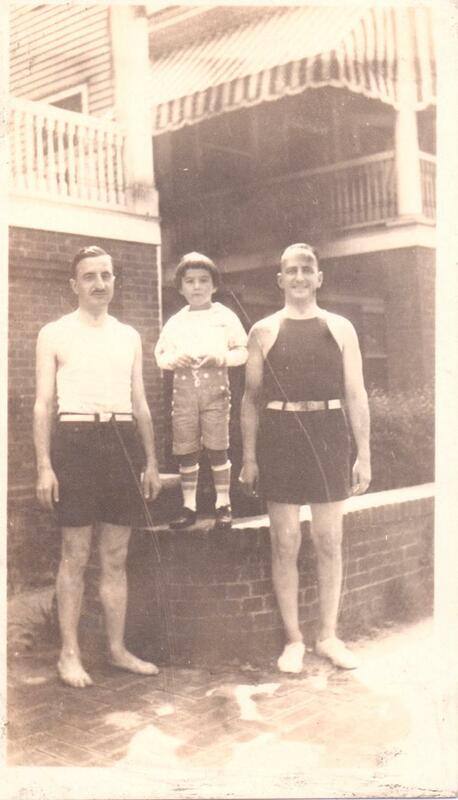 The little boy might be one of my father’s first cousins, Maurice Cohen, Junior, or Emanuel “Buddy” Cohen. 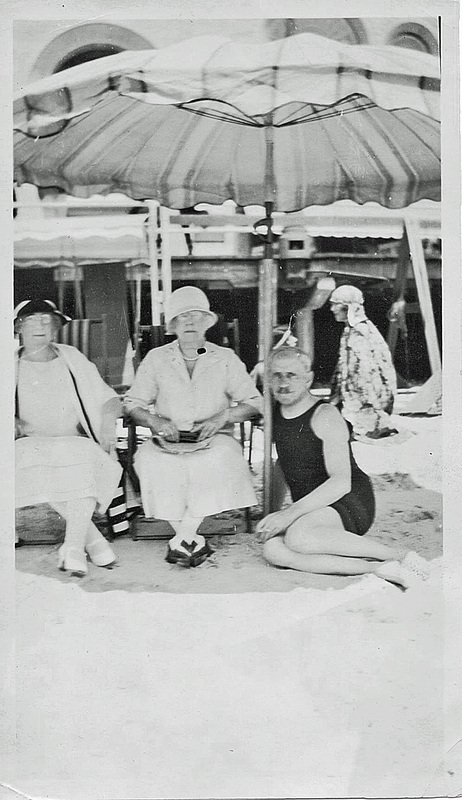 If the older man is Emanuel, the photograph had to be taken in 1926 or before, as he died in February, 1927, and this is a photograph taken in the summertime. 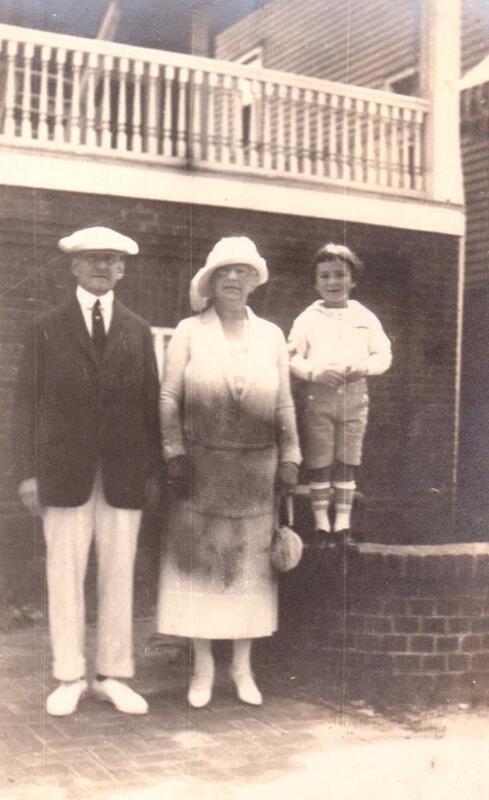 Junior was born in 1917, Buddy in 1922, so it is possible that this is my great-grandparents standing with one of their grandsons. I hope Marjorie can help us. Here is another photograph of that little boy. The man to his left is Stanley Cohen, my great-uncle, Marjorie’s father. But who is the man to his right? 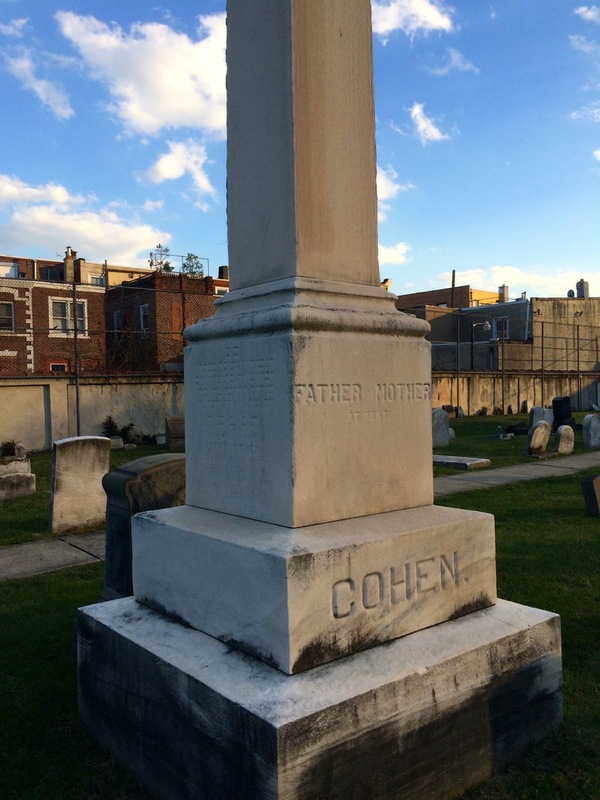 Could it be my other great-uncle, Maurice Cohen, Senior? I’ve never seen a picture of him nor have I seen a picture of either of his two sons, Junior and Buddy. 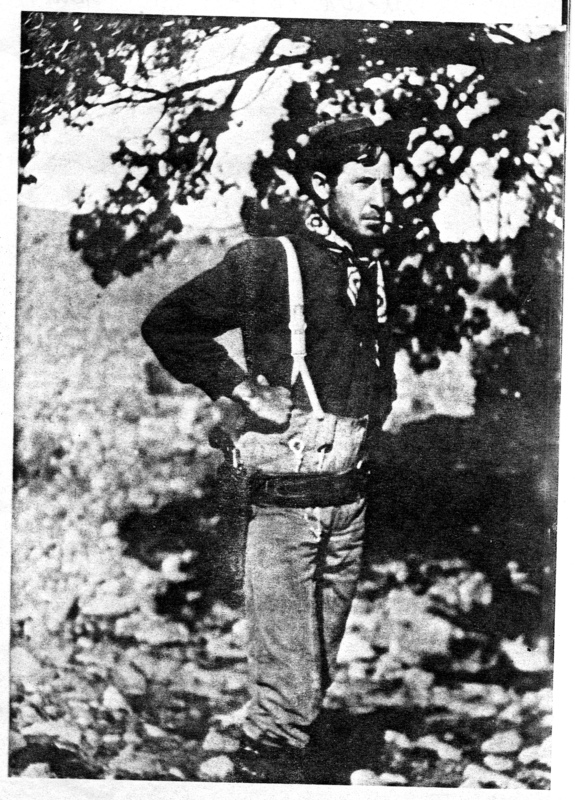 Maurice died in 1931; if this was taken in 1926 or so, this certainly could be him. Maurice would have been 38 in 1926, Stanley would have been 37. Finally, there is this photograph of the little boy. Who is that man? 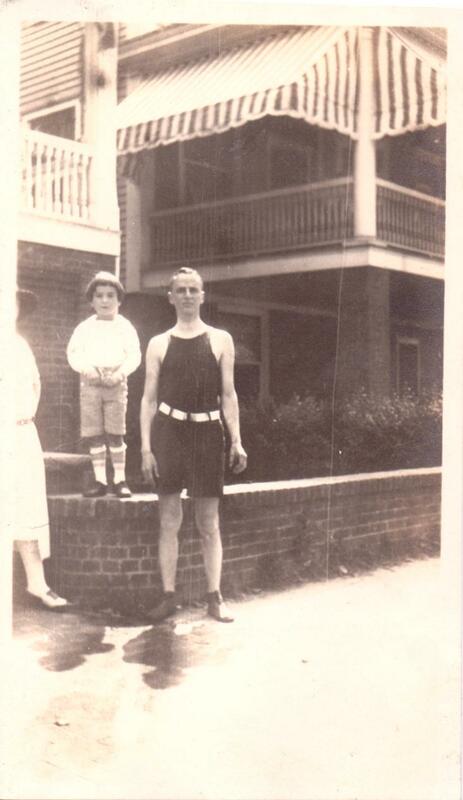 It’s not the same man standing with my great-uncle Stanley in the prior photograph. He seems to be a fair amount younger than both that other man and Stanley. 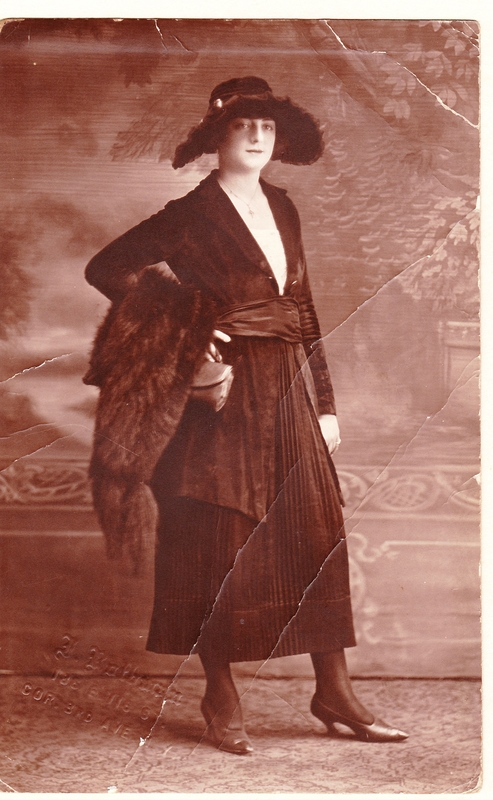 It looks like my great-grandmother was wearing the same or a similar hat and outfit to those she was wearing in the first photograph. I am anxious to hear what Lou learns from Marjorie when he sees her. It’s been a week or so of amazing gifts. First there was the package from Gau-Algesheim with the records and book relating to my Seligmann ancestors and the amazing help I received from Ralph Baer and Matthias Steinke with translation of these items. Then a day or so after the Gau-Algesheim package arrived, I received a gift from my third cousin once removed Todd Graham. 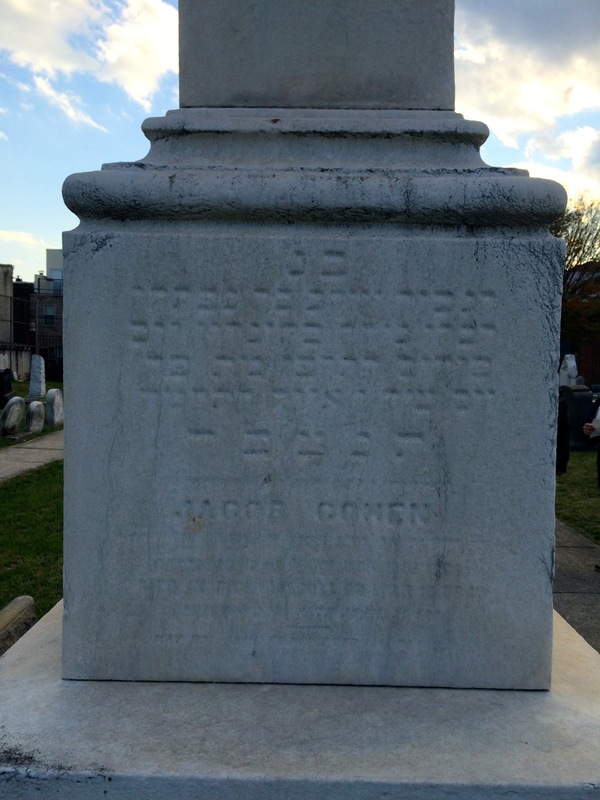 Todd is the great-great-great-grandson of Jacob Cohen, my great-great-grandfather. 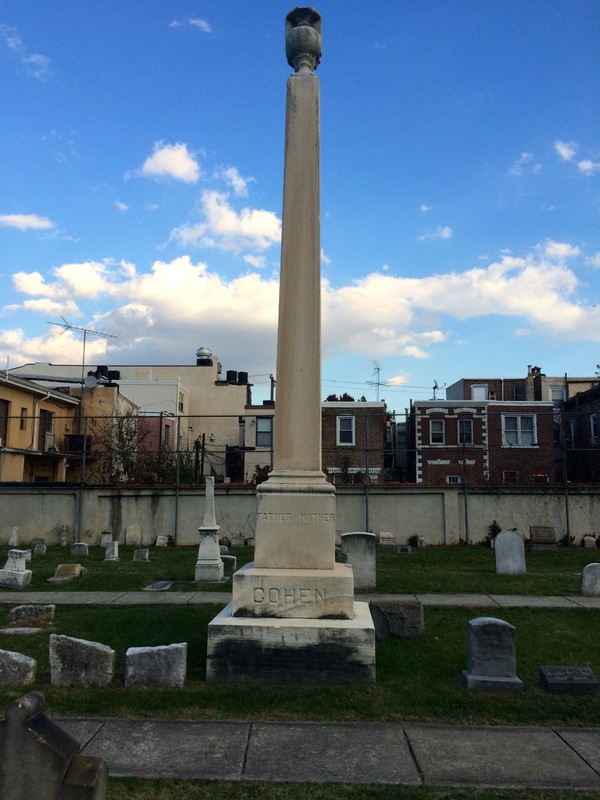 Todd wrote to tell me that he had been to the Federal Street cemetery in Philadelphia where many of our mutual Cohen ancestors are buried and that he had taken photographs. He asked if I wanted to see the photos, and I said of course. So here are the photographs I received from Todd. 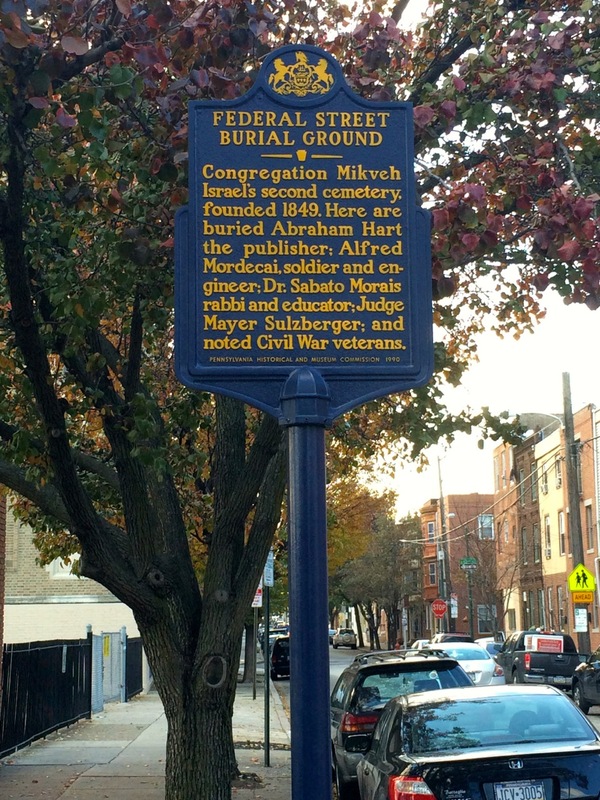 First is a photograph of where our ancestor Hart Levy Cohen is buried. 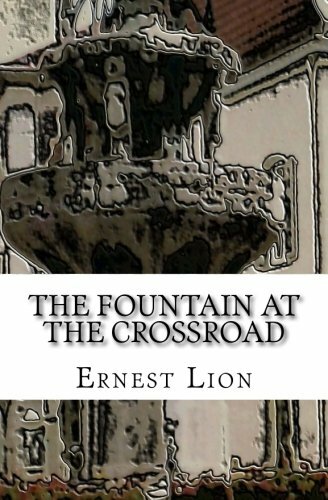 There is no stone visible, and the rabbi at the cemetery explained to Todd that they believed that the stone had sunk beneath the surface and was buried underground. I have written to the rabbi and asked whether there is anything we can do to uncover the stone or to mark the gravesite in some other way. 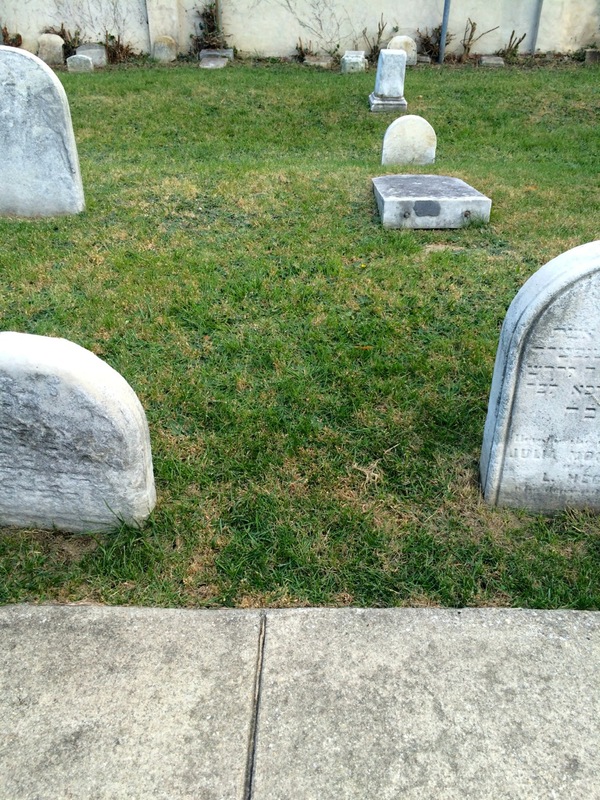 This photo shows where Hart’s children Lewis and Elizabeth are buried. 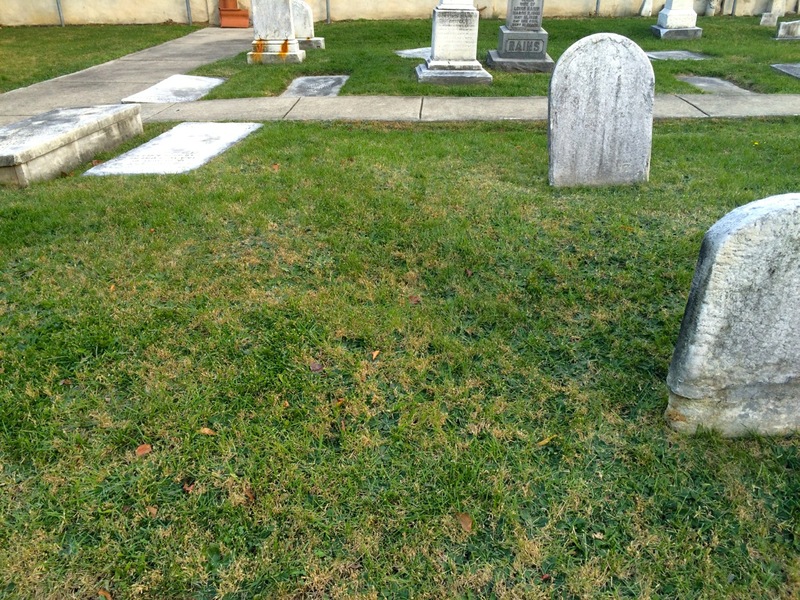 Again, the stones are not visible, but this is the location of their graves. 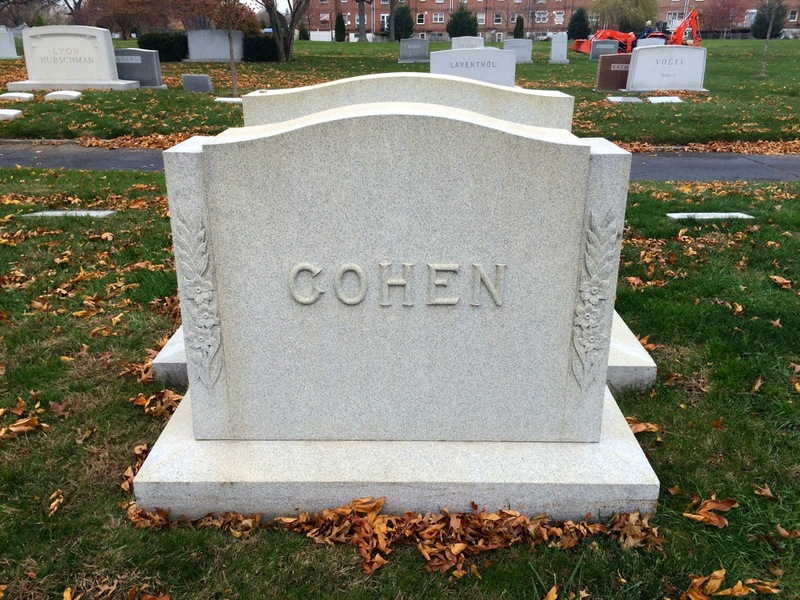 Todd also took photographs of the stone for Jacob and Sarah Cohen. 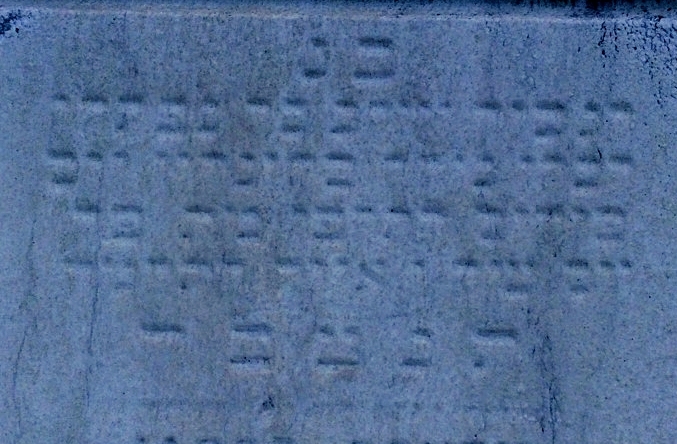 Although I had a photo of this stone before from Rabbi Albert Gabbai, I am hoping that these will be easier to read so that I can learn what the Hebrew inscription says. Todd also found the stones for three of Jacob’s children. 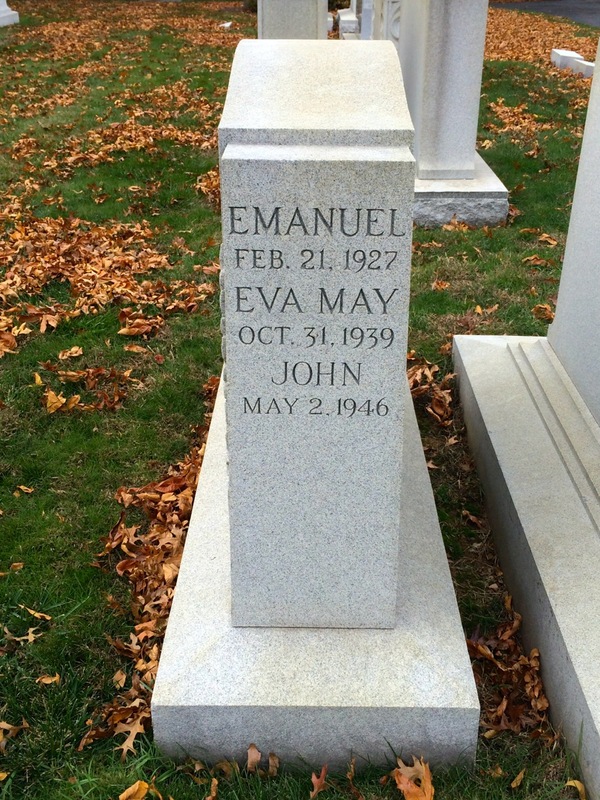 First, a new photograph of the headstone for my great-grandparents Emanuel and Eva (Seligman) Cohen and my grandfather John Nusbaum Cohen, Sr.
Next are photographs of the headstones for Emanuel’s brother Reuben and his wife Sallie Livingston Cohen and of their son Jacob Livingston Cohen. 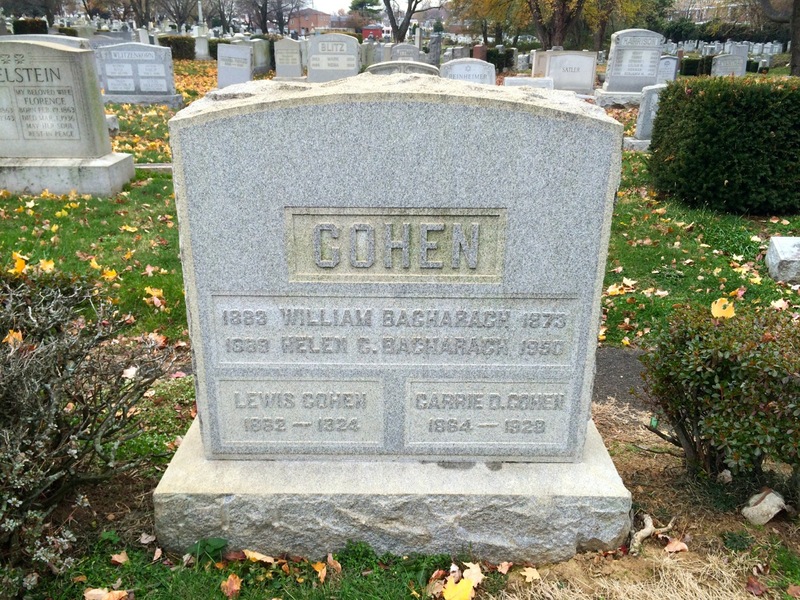 And finally, this is a photograph of the headstone for Todd’s great-great-grandparents Lewis and Carrie (Dannenbaum) Cohen and his grandparents William and Helen (Cohen) Bacharach. 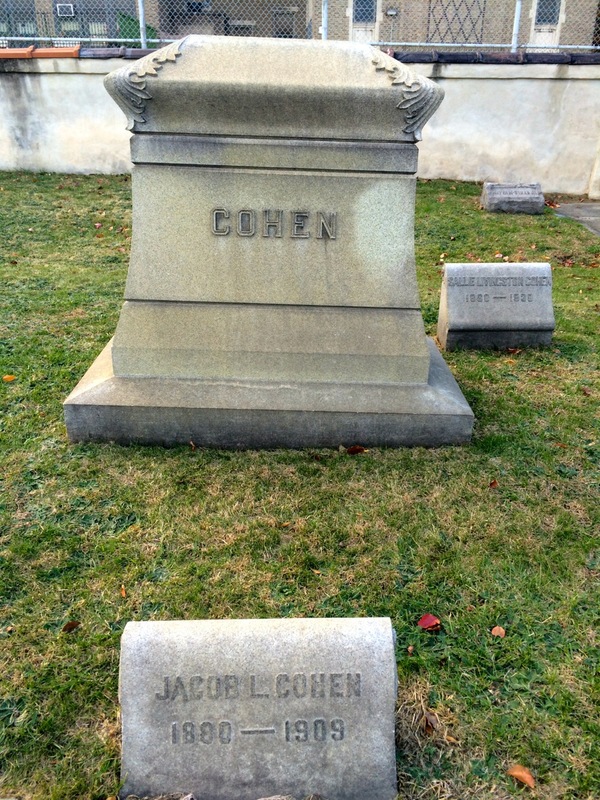 Lewis Cohen was also the brother of my great-grandfather Emanuel Cohen. Thank you so much, Todd, for these photographs, and I hope that we can do something to honor the graves of Hart, Lewis, and Elizabeth Cohen. There is one more gift I want to acknowledge, and it came totally unsolicited and from a total stranger. About two weeks ago I received a comment on the blog from someone who had found a set of matches on a website selling vintage items. 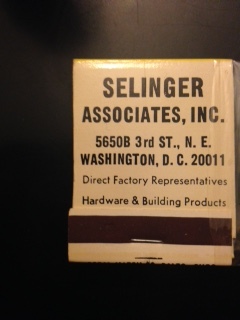 The matches were for a business called Selinger Associates at an address in Washington, DC. Kimberly Crosson, the woman who commented on the blog, had purchased these matches and was now asking me whether this business was connected to the Selingers on my blog. I was skeptical at first, I must admit. I thought it was some kind of scam or spam. But I emailed Kim and found out that not only was she not looking to make money, she was incredibly kind-hearted and generous and just wanted to get the matches to someone in the family—for no charge. I checked the address and found that this was Eliot Selinger’s business. Then I tracked down a descendant of Eliot Selinger and asked him if he was interested in the matches, and he was, so I put him in touch with Kim so that she could send him the matches. I asked only for some pictures of the matches, so here is what Kim sent to me. You can tell these are from a different era once you see the picture on the matches. So once again, let me express my thanks to all these generous people, especially Todd and Kim for these photos, but to all who have helped and continue to help me with my research. I could never have done all this on my own. And now I will be taking a short break from blogging for Thanksgiving. May you all have a wonderful Thanksgiving, and thank you all for supporting me and providing me with so much help as I continue to learn about the lives of my ancestors. Whose Clothing Were They Wearing? I recently posted these two photographs of two of the Strolowitz/Adler sisters, Rebecca (Ray) and Leah. A number of people asked me questions about the photographs. In particular, people were struck by the fact that two poor immigrant young women were dressed so well and were able to sit for a formal portrait. The photograph was dated 1918, so Ray and Leah had only been in the US for about ten years. They were both working as dressmakers. How could they afford these luxuries like furs and hats and fancy shoes and a studio photograph? I also posted a question to the Tracing the Tribe group on Facebook about these issues and received numerous responses that were very helpful. One commenter pointed out that since Leah and Ray were dressmakers, it was entirely possible that they made these outfits themselves. The commenter recalled that her own ancestor was able to create fashionable dresses from older clothing and scraps by copying what she had seen in store windows. Another commenter made the point that furs may not have been that expensive back then. There was also discussion of the possibility that the furs and hats were props supplied by the photographer to supplement the clothing that belonged to the customers. And some commenters believed that photographers did have clothing at their studios for the customers to wear. I was also able to locate some information about the photographer. From the photographs I was able to find his name, Rothman, and address, 186 East 116th Street in New York. 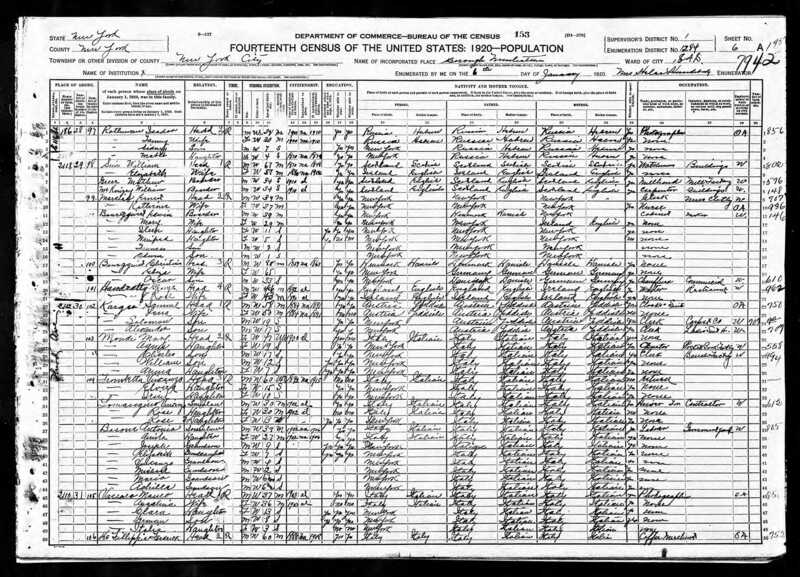 By using the stevemorse.org tool for finding an address on a census, I was able to find Isadore Rothman, recent Russian immigrant, residing at 186 East 116th Street. In 1916, Mr. Rothman was working for a different studio, Mantor Photographic Studio, according to the 1916 New York directory. So perhaps Rothman was just starting out on his own when Ray and Leah came to have their pictures taken. They also all lived in the East Harlem neighborhood. So I don’t know the answer for sure, but it is possible that Leah and Ray made their outfits or borrowed them from the photographer or from someone else or a combination of both. I guess we will never know. And it is also possible that these photographs were not that expensive despite their seeming formality and quality. UPDATE: I just received this comment from Ava Cohn, an expert in using photographs in genealogical research. She said, “Photographers did have props that were used in photos. By this time, however, the clothes were usually not part of what was “borrowed” from the photographer. As many have suggested, our Jewish ancestors were tailors in Europe and quite adept at pattern-making and sewing. There were also many companies that produced patterns and sewing one’s own clothes was both a business and a past-time. Studio photos were relatively inexpensive. 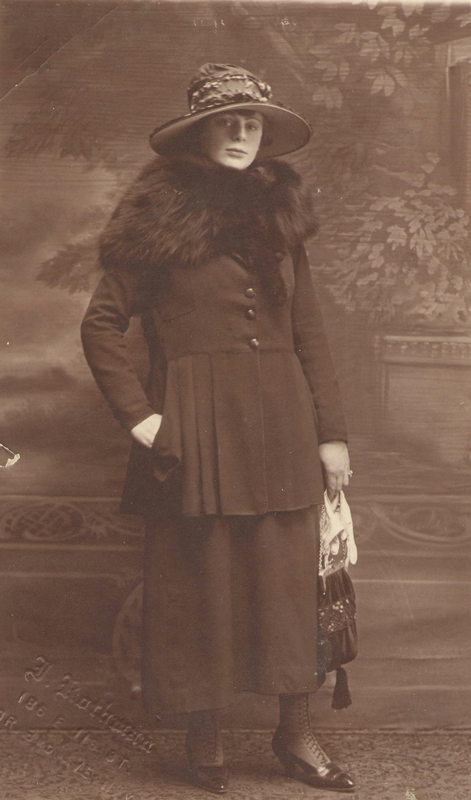 … And btw, if you are certain that your photos were taken in 1918, then Ray’s outfit is not the latest fashion. Her skirt length and shape are more typical of the 1916-1917 period.” You can learn more about Ava Cohn and her services at her website, Sherlock Cohn. 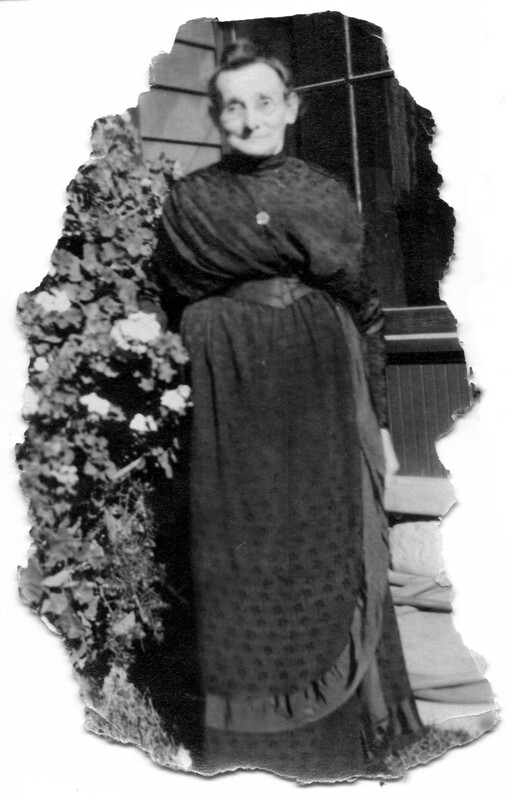 When I published the photograph of Ray Strolowitz Adler several days ago, my cousin Jean emailed me to say that she was struck by the similarity between that photograph and one she had sent me months ago of her grandmother Leah Strolowitz Adler, Ray’s younger sister. Looking at both photographs more carefully, you can see that they were taken at the same studio with Leah and Ray standing in similar poses. You can definitely see the family resemblance between the two sisters. 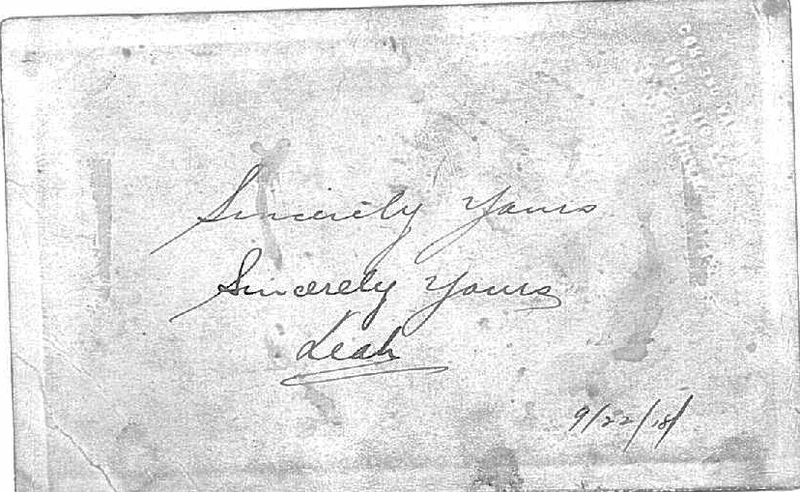 In rescanning the photo of Leah, Jean took it out of the frame and found this inscription on the back. If both photos were in fact taken at the same time in 1918, this would have been after Ray was married and a few years before Leah married. I wonder if all the siblings had these portraits done. Unfortunately, the others may have been lost forever. It always surprises me when I see studio portraits of the recent immigrants who could not have had a lot of extra money to spend on luxuries, yet so many of them did have these photographs done. I am so glad they did, and I am so lucky that their descendants were willing to share these two with me.